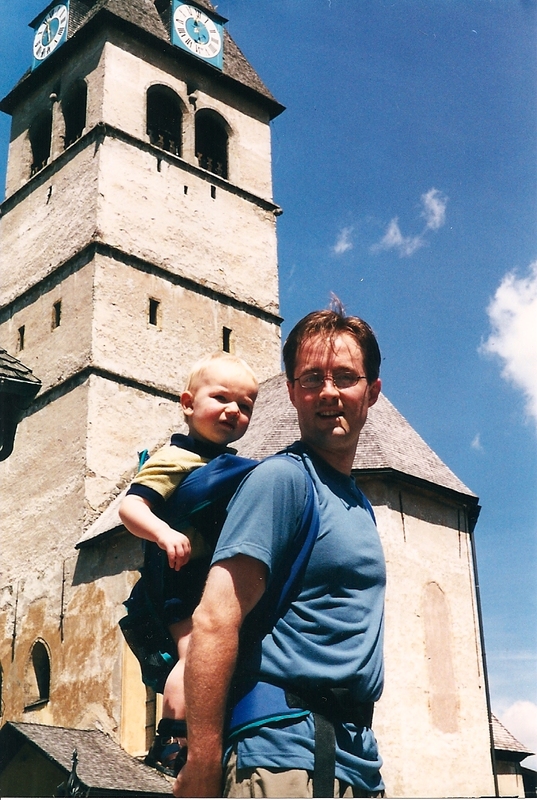 In 2001, I joined my wife on an adventurous business trip to Germany and Austria. It was adventurous less for our adventure and more for who joined us: our 1-year-old son. He was an active dude, who quickly got to know everyone on the plane as he ran up and down the aisles greeting people. Of course, whether ascending or descending, the plane is almost always at a pitch, and while running downhill, Oldest Boy would really get to motoring, up to and past the point of falling. Just a couple of good looking guys, out for a cruise in Kitzbuhl. "How you doin', ladies?" It was exhausting, and all three of us slept for 14 hours once we bedded down in our Garmisch-Partenkirchen inn at the day’s end. In any event, when we returned, I felt I had a singular look inside the travails of traveling with kids. It was no cakewalk, but it could be done, and I had insider information. I knew people who knew people at the Chicago Sun Times, so I wrote up my first big travelogue and hoped to make a sale. I must have botched the initial impression, because even though I thought this was pretty good, I was politely declined. There went my career as a travel writer. Perhaps I would have been miserable … though I’m looking for a downside to travel writing and I just can’t find one. Of all the triumphant sights in Germany—Hitler’s Alpine aerie, Ludwig’s mad castle, the basilica of the beer-brewing Benedictines in Ettal—none was sweeter than my wife pressing a package of diapers to the window of a Munich gas station. I breathed a sigh of relief when I saw it…a stinky, stinky sigh of relief, since my 1-year-old son’s current (and last remaining) diaper had filled the car with more than the air of desperation, if you know what I mean. This station was truly our last hope for finding a fresh nappy in, apparently, all of Germany. It was a simple mistake. Between the diaper bag supply and the suitcase stash, we miscounted our inventory, just before my boy’s pants went atomic. No diapers? No problem—if you have the ubiquitous American retail system at your service. But shopping in Germany is a weisswurst of a different color. Turns out this wasn’t such a small detail after all. All stores—and that meant all stores—closed at 5:00 on Saturdays. We had missed last call by an hour. Worse still, those same stores remained closed on Sundays. And, of course, the kicker: Monday was Pfingstmontag, or Pentecost Monday, a national holiday. In America, of course, it’s inconceivable to imagine a thing that cannot be bought at any hour of any day, especially something as essential as a disposable poop catcher for your infant. But here in Germany, we were looking another 60 hours of diaperlessness. What was next: Ringing doorbells? Really? Gas station convenience stores are a novelty in Bavaria? With a son who was growing increasingly vocal about the situation in his drawers, we drove 15 frantic minutes to an unassuming little box of a gas station. When my wife held that package of “Fixies” brand disposables against the window, it felt like opening day of Oktoberfest. * Be patient. Travel is never going be the same way for you now. Admit it. Move on. * Expect that not you will enjoy everything the way you want. On more than one walking tour of a gold-gilded palace, I hung back from our tour groups to minimize the distraction of a fussy baby. Granted, this was a small mercy on some of the stuffier palatial tours—but I accepted this eventuality before I even bought my ticket. * The umbrella stroller is magic. An umbrella stroller whisks baby from car to terminal to gate, a walk of approximately 20,000 leagues in most airports. Then, right before boarding it collapses into a neat tube that most flight attendants are happy to store special for you. (We managed to get some seats backing up to bulkheads, so the stroller could be tucked right behind us.) Don’t spend more than $50 on one of these; the more geegaws they have, the clunkier they are. We went bare bones and were never sad. * Go fearlessly. Few Germans seemed to take their kinder out to eat at restaurants. (Yet, strangely, dogs were welcome everywhere.) We took our baby anyway, and discovered that even though we sometimes felt conspicuous and out of place, we were just as often received with warmth by servers and locals who admired our bravery and our son’s spirit. Having our son along made new cultural connections possible. * Take few toys—but make ’em good. We didn’t want to haul a daycare’s worth of toys across Europe. To keep our son occupied in the car, we selected one manageable chunk of plastic that had a bunch of manipulation points—clicking, whirring, popping up, snapping down, tinny music and a poorly digitized voice chip. Even if the incessant tinkling and tootling from the back seat bordered on a violation of the Geneva Convention, it kept him occupied on sometimes lengthy drives. * Count those diapers. At least once a day. And as a last line of defense, keep one spare tucked in an outer pocket of a suitcase. You just never know.